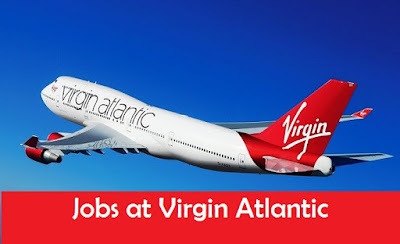 Virgin Atlantic Jobs In UK. Virgin Atlantic is one of Britain's best known airlines with its headquarters based in Crawley in West Sussex. Established in 1984, this airline has gone from strength to strength, and today it operates flights from both London Heathrow and London Gatwick airports as well as Manchester, Glasgow and Belfast. Virgin Atlantic carries over 5 million passengers every year and is the UK's 7th biggest airline in terms of passenger volume, so it is easy to see why this airline is a major employer within the aviation industry. Virgin Atlantic jobs in the UK are highly sought after and there are many excellent opportunities with the company, with roles that encompass numerous sectors. What Types Of Virgin Atlantic Jobs In The UK Are There? Travel opportunities - employees can take up to 7 return standby flights every year with only the tax to pay to any of the airline's global destinations. Pension - employees benefit from the Group Personal Pension Plan. Life Assurance and Dependents' Pension - should an employee die while in service, their beneficiaries will receive a tax free lump sum as a payment. A monthly income will also be provided for their dependents. Income Protection - this gives long term income protection benefit should an employee find that they cannot work because of an injury or illness. Air-share - profit share - this gives employees the chance to share in the company's success. Childcare Benefit - Virgin Atlantic jobs come with the benefit of a childcare voucher scheme through salary sacrifice for any employee with a child under 16. Private Medical Plan - the company pay an annual premium for employees' private health care and for medical treatment for their family members. Bike-4-Work - this scheme allows workers to exchange some of their salary in exchange for bicycle leasing. Holiday purchase - employees can choose to exchange a portion of their salary in exchange for up to one more week of holiday each year. Staff store and Salon - the staff store at The Base allows workers to choose from cut price beauty products, travel accessories and leisure wear and the onsite salon gives workers reduced price beauty and hair treatments. The Virgin Atlantic website has its own careers section where you can search for and apply for positions that meet your skillset. It is possible to search by location, contract type, salary, job type or keyword to stand the best chance of finding an ideal position. Once you have found a suitable position on the website, you can submit an up to date CV and a covering letter in support of your application to the company. Depending on the role that you apply for, the application process may differ as some positions require the candidates to undergo specific testing or assessments. Some of the tasks you may be asked to complete include role plays, group discussions, ability tests, presentations or biographical interviews. These will take place at one of the airline's assessment centers which are located in Crawley, Gatwick, Heathrow or Swansea. What Types Of Skills Are Essential For Virgin Atlantic Jobs? The types of skills and qualifications necessary for Virgin Atlantic jobs will vary depending on the role, with some positions being suitable for entry level candidates and others requiring many years of experience and industry specific qualifications. However customer service is a key part of the business and therefore excellent people skills are very important for the majority of jobs with this company.